Massachusetts – A restaurant owner was surprised to see the lobster shipment addressed to him. Posts were filled by a variety of lobster with a variety of colors. “When employees when opening the mail that they were surprised, thought the distributor sends a cooked lobster,” said Fresh Catch Seafood Restaurant owner Bill Sarro, told Emirates 24/7, Monday (07/23/2012). 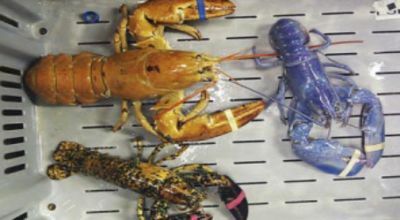 The reports on this odd-colored lobsters are rarely found in the New England region, Massachusetts. Lobster they get, usually greenish brown. But in recent years, lobster-colored blue, orange, yellow, white and even color mix is often found. It seems the news about the lobster fisherman who finds a variety of colors ranging continues to bloom. According to a marine researcher, was also surprised by the discovery of a variety of lobster that has the color of this variety. Chances are obtained even reach 1 compared to 10 million.